My ACNM legislative tenure ended on a great high. The Midwifery Care Access and Reimbursement Equity Act of 2009 passed last March; as of January 1, 2011, the CNM reimbursement rate will increase from 65% to 100% of the Medicare Part B fee schedule. My other role as chair was to help organize midwives from across the country for Lobby Day. ACNM hosts its Annual Meeting in DC once every four years so midwives can meet with their legislators in person on Capitol Hill and discuss issues vital to the sustainability and growth of midwifery. This is one of the most important personal contributions we can make to our profession. I am so proud and thankful that more than 450 midwives (from forty nine states) met with more than 300 offices that afternoon. It was quite a sight to walk up and down the streets of the Capitol and see midwives on every corner. As a Washington state midwife, I was quite proud of our strong contingency. More than 25 of us met with Senators Murray and Cantwell’s offices, and then split into individual groups and met with each US representative (or their staff) from our state. The focus of our visit was a new bill that ACNM is championing called the MOMs 21 Act, which stands for Maximizing Optimal Maternity Services for the 21st Century. This bill will improve maternity care outcomes for mothers and babies and bend the cost curve of our maternity care expenditures in the US. It has many components, and the section we are most interested in will establish reimbursement for midwives who supervise residents, medical students, and student midwives in academic health centers. After we met with our legislators, nearly 450 of us gathered at a nearby restaurant for a Capitol Hill reception, where we rehashed our day, celebrated equitable reimbursement under Medicare, and watched 10 legislators (or their staff) receive ACNM awards for their contributions to midwifery and women’s health. The highlight was when Senator Menendez (D-NJ) ended his speech by saying, “I love midwives!” I had tears in my eyes and felt so proud that midwives have such vital voices on Capitol Hill. I hope you can join us the next time we are in DC. Putting a face on midwifery for our legislators is essential to effect change in the laws that regulate our practice. Heather Bradford served on ACNM’s Government Affairs Committee (GAC) since 2001, including three years as chair. 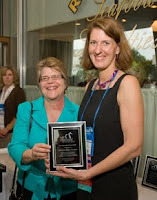 She received an ACNM Public Policy Award at the Capitol Hill Reception.